A language which displays the full range of stops, nasals and laterals is Kalkatungu, which has labial p, m; "dental" th, nh, lh; "alveolar" t, n, l; "retroflex" rt, rn, rl; "palatal" ty, ny, ly; and velar k, ng. Wangganguru has all this, as well as three rhotics. Yanyuwa has even more contrasts, with an additional true dorso-palatal series, plus prenasalized consonants at all seven places of articulation, in addition to all four laterals. However, few other linguists accept Dixon's thesis. For example, Kenneth L. Hale describes Dixon's skepticism as an erroneous phylogenetic assessment which is "such an insult to the eminently successful practitioners of Comparative Method Linguistics in Australia, that it positively demands a decisive riposte". Hale provides pronominal and grammatical evidence (with suppletion) as well as more than fifty basic-vocabulary cognates (showing regular sound correspondences) between the proto-Northern-and-Middle Pamic (pNMP) family of the Cape York Peninsula on the Australian northeast coast and proto-Ngayarta of the Australian west coast, some 3,000 kilometres (1,900 mi) apart, to support the Pama–Nyungan grouping, whose age he compares to that of Proto-Indo-European. It has been inferred from the probable number of languages and the estimate of pre-contact population levels that there may have been from 3,000 - 4,000 speakers on average for each of the 250 languages. A number of these languages were almost immediately wiped out within decades of colonization, the case of the Aboriginal Tasmanians being one notorious example of precipitous linguistic ethnocide. Tasmania had been separated from the mainland at the end of the Quaternary glaciation, and Indigenous Tasmanians remained isolated from the outside world for around 12,000 years. Claire Bowern has concluded in a recent study that there were twelve Tasmanian languages, and that those languages are unrelated (that is, not demonstrably related) to those on the Australian mainland. ^ "Dixon (1980) claimed that all but two or three of the 200 languages of Australia can be shown to belong to one language family – the 'Australian family'. In the same way that most of the languages of Europe and Western Asia belong to the Indo-European family." Hallett, Darcy; Chandler, Michael J.; Lalonde, Christopher E. (July – September 2007). "Aboriginal language knowledge and youth suicide". Cognitive Development. 22 (3): 392–399. CiteSeerX 10.1.1.134.3386. doi:10.1016/j.cogdev.2007.02.001. O'Grady, Geoffrey; Hale, Ken (2004). "The Coherence and Distinctiveness of the Pama–Nyungan Language Family within the Australian Linguistic Phylum". In Bowern, Claire; Koch, Harold (eds.). 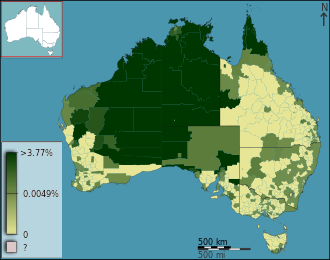 Australian Languages: Classification and the comparative method. John Benjamins Publishing. pp. 69–92. ISBN 978-9-027-29511-8. Walsh, Michael (1991). 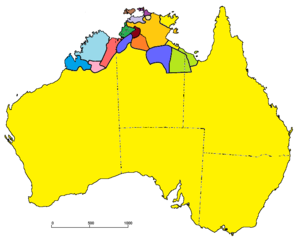 "Overview of indigenous languages of Australia". In Romaine, Suzanne (ed.). Language in Australia. Cambridge University Press. pp. 27–48. ISBN 978-0-521-33983-4.